The EACC is the UK’s leading club for cyclemotor, autocycle and moped enthusiasts. The club is run for the mutual benefit of all its members, all our committee members and officers are unpaid volunteers and we do not seek to make a profit. We also try to be as open and inclusive as we can: there are no exclusive ‘members-only’ areas on this website. Our policies, minutes and accounts are available for all to see. We welcome non-members at our events. We are happy to give help and advice to non-members. The Club Information Sheet on our Documents Page gives the contact details for club officers. The same page also has all the information referred to above: accounts, meeting minutes, past newsletters, etc. We had a committee meeting at the Radar Run, mainly to make sure we are doing the things we were asked at the AGM. The minutes are available on our documents page. I don't think there’s anything earth-shattering in there. The AGM voted to increase the annual subscription fee to £8. In her treasurer’s report, Sharon explained the actual expenses incurred per member. Despite the fact we’re losing money on membership, the club accounts are not ‘in the red’, mainly because dating certificates and V765s subsidised the club by about £2,400. There has been an increase in dating requests for imported European mopeds this year and we think this might be a ‘Brexit effect’: people are buying mopeds from Europe now because they expect the process will get bogged down in paperwork after Brexit happens—we don’t want to be relying on this income next year. The £2 increase still doesn’t cover costs completely. Dave Watson offered to take over editing The MAC following Martin Wikner’s resignation. Dave will start from the February edition. The AGM gave a vote of thanks to Martin as retiring editor for all his work and improvements to The MAC. Our Club won the prize for the best club stand at the Copdock Motorcycle Show. As usual, we had a hige variety of bikes on our stand, many of them rare beasts, but this year we were trying out a new layout for the stand. 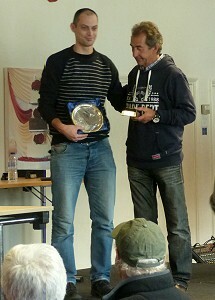 The picture shows Martin Gates accepting the award from Steve Parrish. Club membership is open to all. There are no geographical restrictions on who can join. We have members all over the UK, and several overseas members too. The UK membership fee is only £8.00. You can find out more about joining the EACC here. We also offer the option of joining on-line using PayPal. We have a full programme of runs and meetings throughout the year. See the Events page for more details. Our newsletter is called ‘The MAC’ and it’s sent out to all members at the beginning of February, April, June, August, October and December. (If you’re wondering where the name MAC comes from - have a look in our glossary.) We’re keeping the newsletter simple (We recommend you to try Iceni CAM Magazine for all the things we don’t cover in our newsletter). If you’re not a member and are wondering what it’s like, back numbers can be downloaded from our documents page. The EACC is a member of the Federation of British Historic Vehicle Clubs (FBHVC). The FBHVC monitors both domestic and European legislation, on the look-out for anything that could have an adverse effect on using our vehicles. The EACC is approved by DVLA for the validation of V765 forms. These are the forms you use in the UK to re-register an old vehicle while retaining its original registration mark. The EACC can also issue dating certificates for registering machines with an ‘age-related’ registration mark. For more information about what this all means—have a look at our Registrations page. Peter James Insurance offers discounted rates on insurance for EACC members. You can get a quotation at www.peterjamesinsurance.co.uk or phone 0121 506 6040. RH Specialist Insurance runs an FBHVC-Approved Insurance Scheme for Vintage, Classic & Historical Vehicles. Phone 01277 206911 for information and a quotation. Most other specialist classic insurers will give a discount to club members because we are an FBHVC-affiliated club. These discounts usually apply when insuring vehicles that are over 25 years old and not necessarily to vehicles that are newer than that. As all Lohmann owners know, these compression-ignition cyclemotors won’t run properly on petrol. The solution is to make a fuel mix that includes paraffin. The only problem with that is that it’s illegal to put paraffin in the fuel of a road-going vehicle. We’ve solved that problem. We have obtained a ‘General Licence to mix Hydrocarbon Fuels’, which makes it legal for Lohmann riders to use this fuel mix on the UK’s roads—as long as they are members of our club. If you’d like any of these, please contact Clive & Ann Fletcher at or call . These items are also on sale at our events, of course. Although the club was revived in 2007, we can trace our roots back to 1981. We have adopted the original EACC logo that Andrew Roddham designed 28 years ago. To continue the ‘retro’ look, our membership application form is also based on an EACC membership renewal form from the 1980s. There is more about the early days of the EACC in The Moped Archive.